Leda: Hi. I'm Leda Scheintaub and my cookbook with husband, Nash Patel, is "Dosa Kitchen." Suzy Chase: Dosa is one of the Huffington Post's 10 foods to try before you die, and it is on the list of CNN Travel's world's 50 best foods. The dosa is a staple in south Indian households and street carts. Describe the dosa. Leda: The dosa is a light, crisp crepe made of rice and lentils. It's fermented so it gives it a sour doughy flavor. It's gluten free. It's dairy free. And it's just absolutely delicious. Suzy Chase: Dosa, kind of like a thin pancake or crepe or tortilla, but as you said it's fermented. Walk us through the dosa making process. Leda: You start with rice and lentils. It's white rice and a lentil called urad dal. It's U-R-A-D D-A-L. We also use chana dal, which is made from chickpeas, C-H-A-N-A, and a small amount of that. You soak the white rice and you soak the urad dal in separate containers. You leave them for several hours, about six to eight hours. Then you drain them and you grind them. At home we use an electrical stone grinder, but in the book we give instructions for making it in blender since most people have blenders and not stone grinders. You grind the rice until it's a little bit gritty, and the dal you grind until it's smooth. Then you combine the two. You put it in a big container, and you leave it to ferment for about eight hours at 90 degrees is the optimal temperature. We put ours in the oven with the viewing light on. We find that keeps it at 90 degrees. We've also put in the dehydrator. You could put it on a heating pad that's protected against spills. If it's really warm in your kitchen, you can just leave it out. A lot of people just leave it out. In India, Nash's mother who says, "We don't ferment dosa batter. We just leave it out for a little while." Of course it's very hot there so it naturally ferments. Then you whisk the batter. It will rise, and it could look like a volcanic eruption. That's really good. So you want to have a container that has plenty of room so it will rise without bubbling over. Then you whisk it, and you're ready to make your dosa. It's interesting how you make it. At home we recommend a low-sided cast iron skillet. Put the batter into the pan. Then you spread it using the back of a flat ladle or the back of a dry measuring cup, like a metal dry measuring cup, and you swirl it to coat the whole pan. You let it sit there. When it starts bubbling, you drizzle oil into it, so you don't grease the pan before, sort of an inverse greasing. It crisps it up, and it gets it to not stick to the pan. Then you flip it. If it's a thin dosa, you might not even have to flip it because it'll just cook through. If it's a thicker dosa, you flip it. There's two different kind of dosas that you can be making. There's the classic thin crepe, which if you seen pictures of dosa, that's probably what you've seen, or if you've had a dosa at the one of the restaurants in New York or wherever. They're often a larger-than-life size falling off the plate. That's what people most associate with dosas. But there's also a smaller, thick dosa called uttapam, which is spelled U-T-T-A-P-A-M. The classic uttapam is a chili onion uttapam that they eat in south India. They're both delicious. Actually we have a food truck called Dosa Kitchen as well. At the truck we serve and also in the book we have wrap. It's in between the crisp crepe and the pancake, so the wrap is so you can eat delicious fillings inside the dosa. Suzy Chase: Your food truck is in Brattleboro, Vermont, with your husband, Nash Patel. Talk a little bit about him. Leda: He's from the city of Hyderabad in south India. It's a big city of several million people. It's a tech hub. They eat dosas there all the time. He grew up there eating dosas for breakfast as everybody does. He's from an Anglo-Indian family. That means that he eats broadly. He eats everything. If you notice in the book we have recipes including pork and beef which that often surprises people, but that's part of his heritage, eating those foods. He moved to the US about 12 years ago, and he was living in New York. He was waiting tables at an Indian restaurant. That's where we met, and that's where our story begins. I was a customer at that restaurant. It was a really good restaurant so I was there very often. He would tell me how to eat and what to eat. We connected and we started dating. Eventually we decided to move to Vermont because I had been going there every summer for a month or so. The last summer that we were there we decided to move here, which was 10 years ago. Suzy Chase: What's the most popular dosa that you sell? Leda: I would say the masala dosa. That is the dosa that is on the Huffington Post's list of the 10 foods to try before you die. Masala dosa comes with chutney. It's usually a coconut chutney. And it comes with sambhar. It's kind of like a dal. Nash calls it the king of dal. It's got a bunch of vegetables. It's a little thinner than a typical dal. You dunk your dosa into and eat it. Suzy Chase: See, I thought sambhar was kind of like a vegetable soup. Leda: You could call it that as well. It is soupy. Suzy Chase: But it's more of a dip type of thing instead of spooning it up. Leda: Yeah, for dosas and idlis, which are steamed dosa batter dumplings. I like to have sambhar as a soup, too. I'll dilute it with some broth, and I love to drink it just as a soup. Suzy Chase: Your sambhar recipe in the cookbook calls for one teaspoon of the jaggery. What is that? Leda: Jaggery is India's version of a natural brown sugar made from coconut palm trees. It's got a molassesy flavor, and it adds a depth of flavor to dishes. It's delicious, too. In the sambhar, it's just a small amount of it because there's tamarind, which gives it a tangy flavor so that offsets the tamarind and brings all the flavors together. Suzy Chase: India is a huge country with different variations on the cuisine. Describe south Indian food. Leda: It's hard to really describe the cuisine of south India as a whole because each region has its own specialties, and then there are micro-specialties and family specialties. Then Nash is from an Anglo-Indian family, so they have their own way of eating. But to generalize, in the north, which is most of India, it tends to have more cream in it and to be milder than south Indian. They use a lot of delicious breads and wheat. Their chutneys tend to be sweet like the mango chutneys that people are really familiar with. People are always asking us, "Do you have mango chutney?" and we never do. So south Indian tends to be spicier, little to no cream, and wide use of rice including rice products like dosa and idlis, and the chutneys are more savory like the coconut chutney. Tomato chutneys is another very popular one and green chutney, which is the green coconut chutney, peanut chutney, which is Nash's favorite. I would say those to be the differences are the main differences. Suzy Chase: In this cookbook you have dosa recipes that run the gamut from the traditional masala dosa to a cream cheese, lox, and caper dosa. Talk a little bit about the different types of recipes in this cookbook. Leda: We had a lot of fun putting this cookbook together because we were able to combine our two culinary backgrounds. I'm a food writer by profession. I wrote another book on fermentation, so this was natural to write this dosa book. We have some straight, traditional recipes like the ginger chili beef fry, which is something that comes from Nash's family. His grand used to make it, and his mom still makes it all the time. It's one of Nash's favorite and one of my favorites. It's a beef that is bathed in lots of onions and crisp pieces of ginger and lots of chilies. They do it in a pressure cooker, but in the book the recipe calls for doing it on the stove top. Then we have pork vindaloo. Then we like to be really playful. At the food truck we serve a falafel dosa, which is made with nuts and seeds, and it's baked rather than fried. That's really popular. People can't tell that it doesn't have chickpeas in it. Not that we're against chickpeas. It's just how we came up with the recipe. We have the dosa dog, which is a local hot dog that's wrapped in a thick dosa. We make our own mustard, which we ferment at home. We put that on it, and we have a masala sauerkraut, which is a sauerkraut that we make with lots of Indian spices. Sauerkraut is not traditional to India by any means, but we like how the spices go in it. So we wrap that all up. We add Grafton cheddar cheese, which is made right behind our truck. Suzy Chase: I love that cheese. Leda: Yeah, it's really good. The factory is right behind our truck. Then we even have sweet dosas. In India you could see a dosa with a little jaggery or regular sugar. But we took it a little further and we have the pineapple upside dosa, which a friend of mine, Patricia Austin, developed for us. She runs Wildflower Vermont Bakery here in Brattleboro. It's really fun. It's got pineapple rings cooked into caramelized jaggery, and it's flipped. It's really exciting and delicious. Then there's flambé dosa, which we add some alcohol to a dosa and we set it on fire. It's delicious. We had a lot of fun putting these together. It's by no means traditional south Indian, but there are traditional south Indian dishes in it. We wanted to demonstrate that how adaptable the dosa is. Leda: Dosakitchen.com, D-O-S-A kitchen dot com. If you go there, you'll find the recipes for our master batter recipe and the masala dosa so you can take a peek there before committing to buying the book. We're also on Facebook and Instagram. Both are under Dosa Kitchen. Suzy Chase: Where can we find you in Brattleboro? Leda: At 400 Linden Street, which is on the Retreat Farm, it's a petting farm with lots of animals, and next to the Grafton Village Cheese. Suzy Chase: I do have to mention with all that is happening in the news in regard to migrants, I truly believe that our cuisine in America is more diverse and much more delicious thanks to the immigrants that brings the recipes from their home countries. I feel we're better as a society because of that, and food always brings people together. Thank you so much for teaching us all about dosas, and thanks for coming on Cookery by the Book podcast. Leda: Thank you so much for having me. Suzy Chase: Subscribe in Apple Podcasts. While you're there, please take a moment to rate and review Cookery by the Book. You can also follow me on Instagram Cookery by the Book. 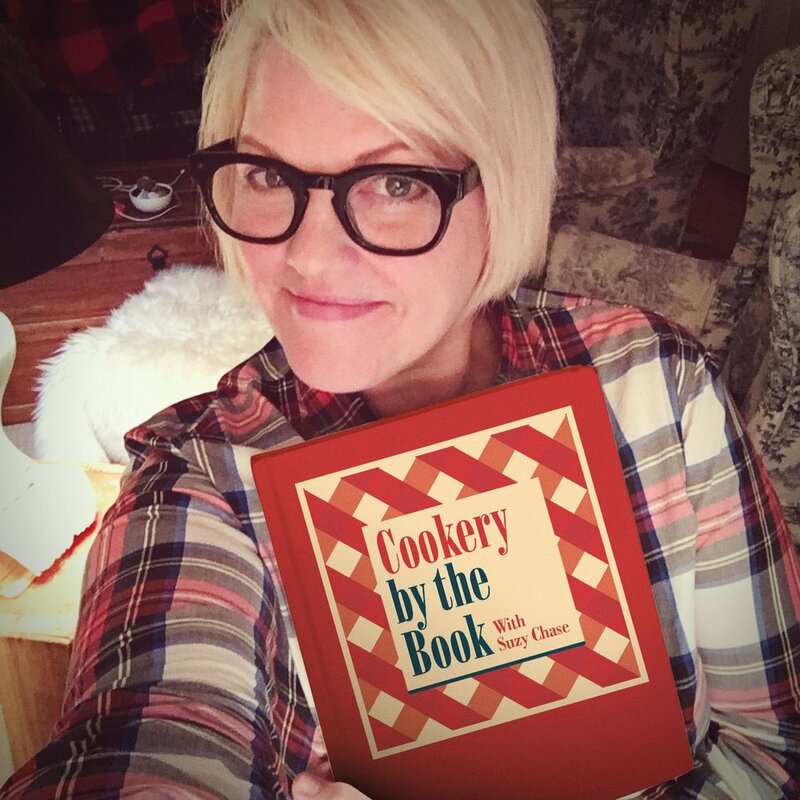 Twitter is @IamSuzyChase and download your Kitchen Mixtapes, music to cook by on Spotify at CookerybytheBook. Thanks for listening.